My friend whispered to me across the way, “Mel! Mel! Come and take a look at this!” I skipped over (yes, skipped as it was the first time in many moons that I literally felt like skipping with glee and excitement and I wasn’t about to waste that moment) to where he was standing. 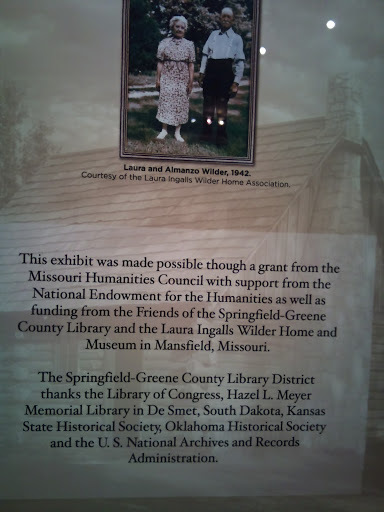 “Look!” he pointed to a big blue with correspondence between Laura Ingalls Wilder (LIW) and her daughter Rose Wilder Lane (RWL). Laura had written to Rose her edits for one of the books. I squealed and jumped up in sheer geeky delight. Here was proof of a complex writing and editorial process between a writer and her editor, between a mother and her daughter. 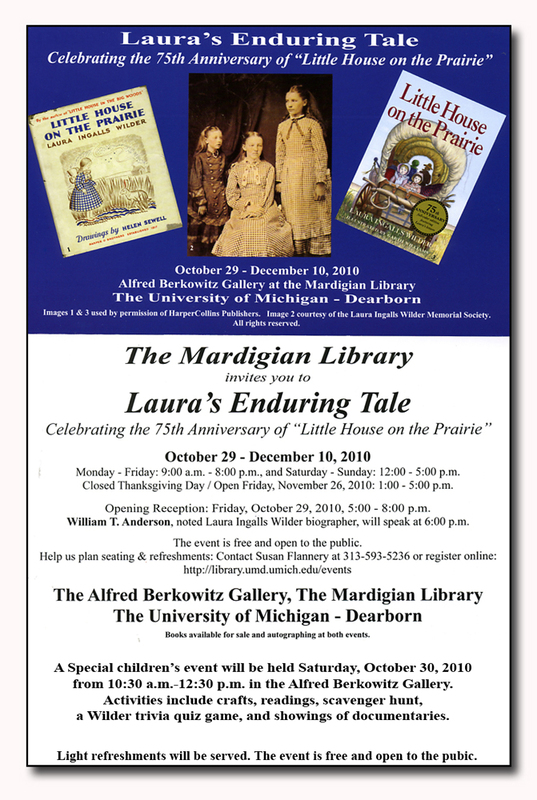 I thought myself a bit mad to be taking a road trip to Dearborn, Michigan to see an exhibit on Laura Ingalls Wilder. The more that I told people that I would be going, the more “”crazy fan” I felt about it. Probably because most people got that amused “there there now” look in their eye. But, like most cosmic journeys, I was moved my some other instinct that I couldn’t quite explain to myself, so, how could I make it sound convincing to others. I love literary road trips. Not only because it is an opportunity to get my literary and historical geek on, but because it gives me new insight into a writer’s process. 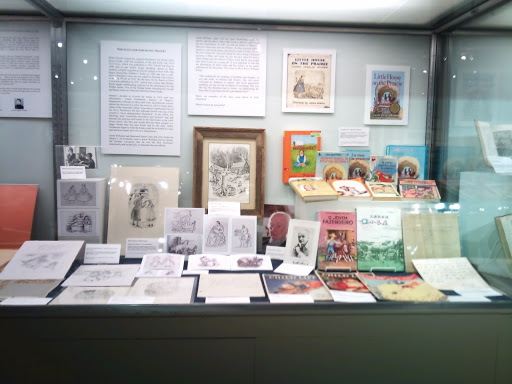 The exhibit was located on the third floor in the Alfred Berkowitz Gallery at the Mardigian Library at the University of Michigan. 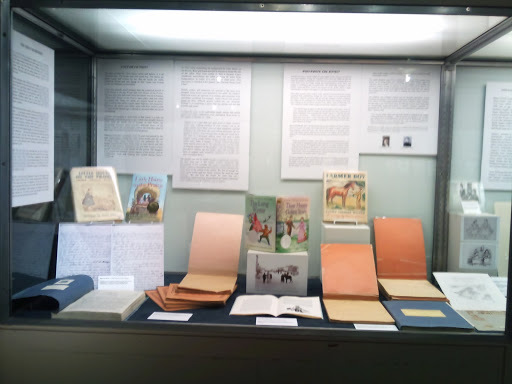 Titled, Laura’s Enduring Tale: Celebrating the 75th Anniversary of ‘Little House on the Prairie,’ it promised to show special collections from thirteen different archives including, the Laura Ingalls Wilder Memorial Society, Herbert Hoover Presidential Library and Museum and Little House Heritage Trust. I thought that I would do my best here to describe for you the exhibit in as much detail as I possibly can. I will put most of the pictures that I took on Flickr for those of you who care to see, but I must warn you, my normal camera has lost its battery life and I was using my cell phone, so the quality isn’t what I would like. Luckily, my friend took pictures too. I’m hoping to get a couple to put up here, particularly for the last two sections of the exhibit as I don’t have photos right now. Imagine that you are walking into a long rectangular room . The front of the room is open with a long table where the monitor or curator sits with their laptop. On the table is a sign-in book, some pamphlets for various Little House sites, a draw and some activities for kids to take home with them. The room is divided up into sections that were separated by low-rise walls. The right hand side is one long aisle, while the left hand side was divided into two separate blocks with a third adjacent to the table at the front of the room. I will describe it to you as if you were walking it counterclockwise around the room. 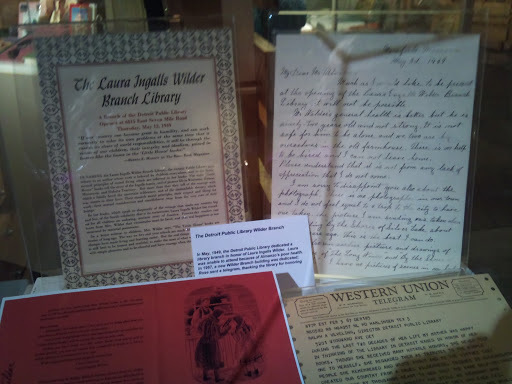 and on my right, the sign said “Laura Ingalls Wilder and Henry Ford in American History.” Inside the case featured some artifacts including a first library edition of Little House in the Big Woods. 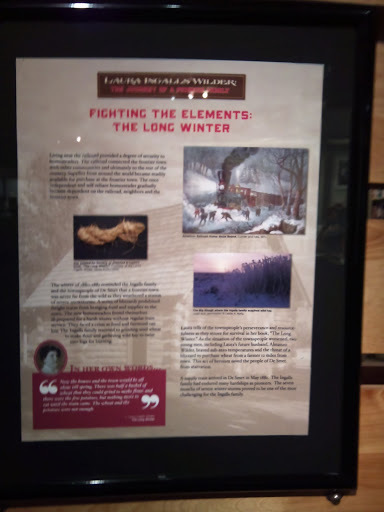 A series of posters “Laura Ingalls Wilder: A Journey of a Pioneer Family” with a general explanation of the Ingalls’ family west within the context of the American western expansion. 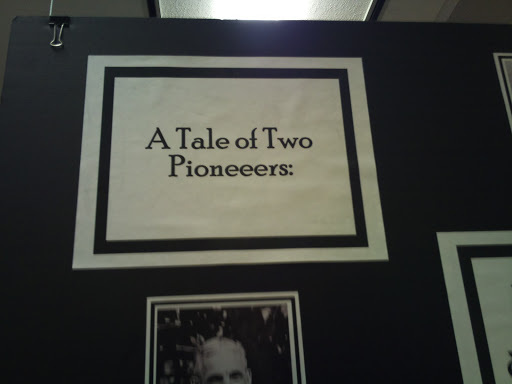 Each poster has a piece of American art depicting the period, a photocopy of a Wilder artifact (such as her teaching certificate) and a quote from Wilder or a photo. A tribute to the Little House on the Prairie TV show. 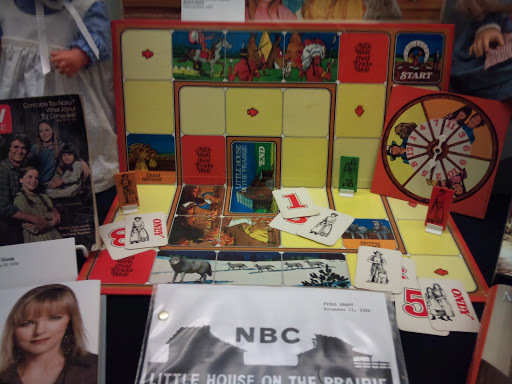 Featuring: Clothing, dolls, photos of the cast, a board game, a signed script by Michael Landon, and two autobiographies by Melissa Gilbert and Melissa Sue Anderson. General artifacts referencing the Little House on the Prairie book. 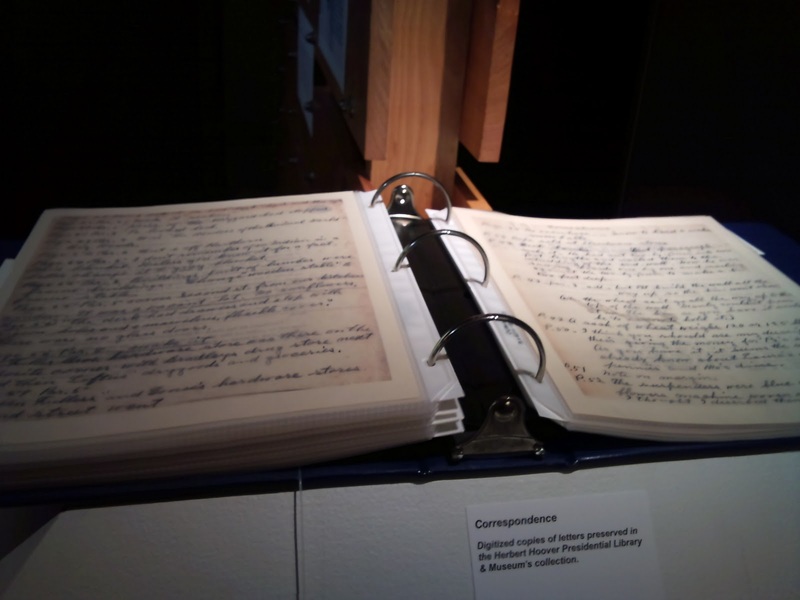 Little House on the Prairie manuscript notes. Double case of items referencing things that occurred during Wilder’s lifetime. JIF peanut butter and SPAM was on display. 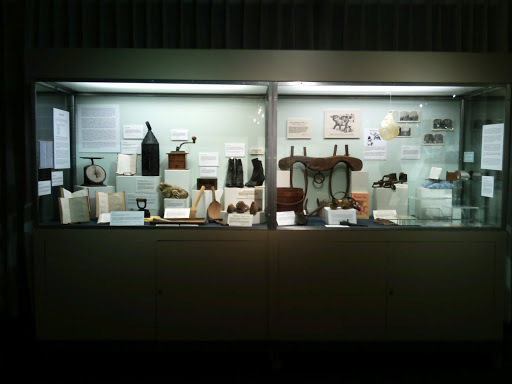 Almanzo Wilder’s boyhood corner featuring tools that were used on the farm in Malone, New York. 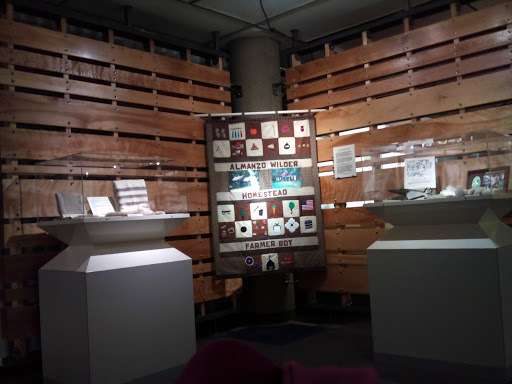 A quilt made by a classroom in 1996 is the focal point. Two small podium glass cases. One on the right: spinning wool, tool used to spin wool. One on the left: fabric made from spinning. General artifacts of items that people would have used during Almanzo’s childhood. Books, boots, health books, snow shoes, daily appliances such as an iron. A podium with a blue binder containing correspondence between LIW and RWL. Wilder’s edits from The Long Winter and These Happy Golden Years. Corner featured William Anderson’s books about Wilder. Art of Dan Andreasen who has illustrated the “Little House Years” series among other adaptations. Second Aisle: Left Hand Side – small cased podium. May 1949, the Detroit Public Library dedicated a branch to Wilder. She was unable to attend because Manly was quite ill. In 1967, a new building was erected dedicating the library in her name. A telegram from RWL in 1967 telling officials how much the library meant to her mother. 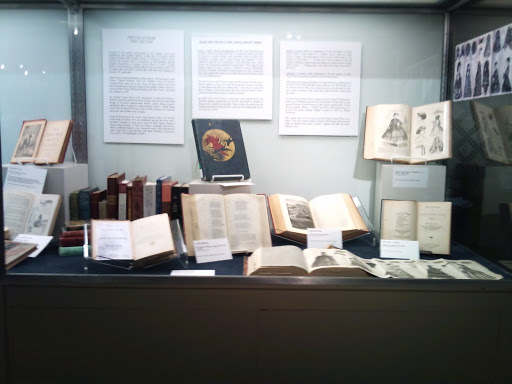 Novels popular during this period and books discussing fashion of the period. Charles Ingalls’s signed copy of Norwood. 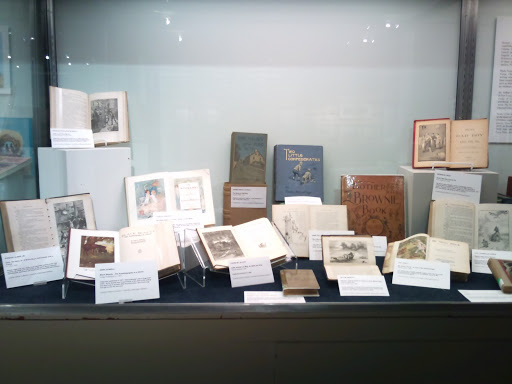 Contemporary children’s books and those featured in the novel. Older editions of Black Beauty and Little Women. Original sketches by Williams for The First Four Years. Signed illustration of Little House in the Big Woods. Original artwork by Helen Sewell and Mildred Boyle. Foreign editions of Little House on the Prairie, Little Town on the Prairie, The Long Winter and others. Children’s magazines featuring Wilder’s writings. Possibly first edition of Farmer Boy with Helen Sewell and Mildred Boyle illustrations. Letter from Wilder to a fan with a map of DeSmet on the back. Original handwritten and typed manuscripts of The Long Winter and These Happy Golden Years. Photos and information about Rose Wilder Lane. Particular attention on the writings of Rose Wilder Lane. Small section on Roger Lea McBride. 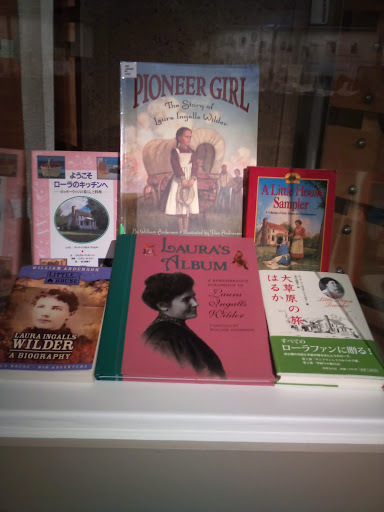 Biographies on Rose Wilder Lane. Photos and information on the Ingalls Family. Early photo of Charles and Caroline Ingalls. Carrie Ingalls’s fan and necklace. Caroline Ingall’s China Doll . Double case of Wilder’s personal artifacts. Wilder’s hat, gloves, home made quilt, china. Several letters of correspondence between Wilder and some of her Detroit fans. 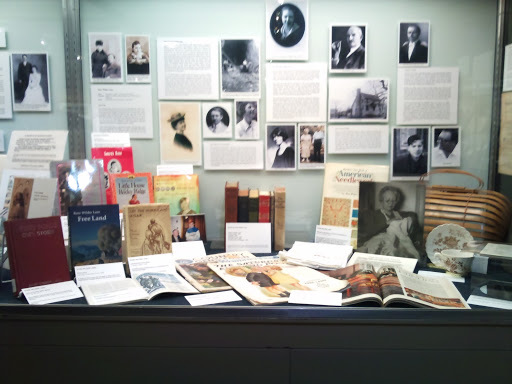 As you can see, the curator took her time to make sure that there was a comprehensive view of Wilder the writer, Wilder the woman and Wilder the pioneer. There is specific references to Little House in popular culture, as well as the people who were most important to Wilder during her life time. 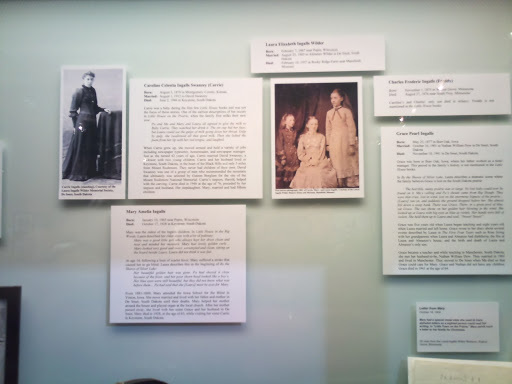 I particularly appreciated the references to other children’s lit during the period, the kitsch from the Little House on the Prairie TV show, and the attempt to give a picture as to what happened to Wilder’s sisters, Carrie, Grace and Mary. To me, this is where another really interesting story lies. I shall leave you with the final “Journey” poster featuring Wilder and her husband Manly on the farm. I have always liked this photo. Perhaps because they know that they are at “Journey’s End” and are content with what they’ve done with their lives. Particularly Wilder, for she had the courage to write her stories like so many of us wish to do. 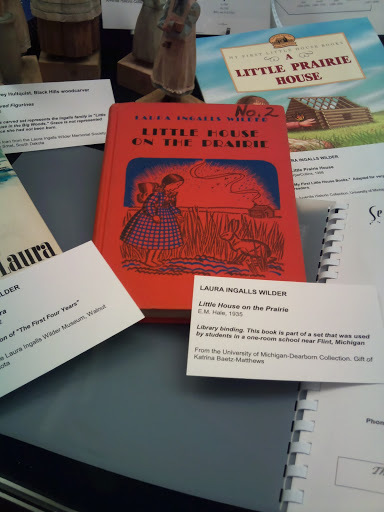 This entry was posted in Authors, Children's Literature, Laura Ingalls Wilder. Bookmark the permalink. Thanks for posting this! I love Laura Ingalls Wilder and this was a real treat to read! Which ones do you mean? Are they the ones with Laura's items in them, such as her hat and sewing basket, etc.? I was finally able to get the pictures on my computer and posted them on my facebook page last night. For some reason, my camera doesn't always want to recognize my camera card. My husband actually took quite a few views of those two displays. Let me know. Or through my blog you may be able to click onto my facebook page and see them. Hi Laura,Sorry that it took so long to answer your question. Yes, I was thinking of that exact case. Unless you want to just link to the Facebook profile in the comments field… Thanks! Sorry for the delay. Finally through the Christmas busy-ness! Here is the link to my facebook facebook.com/jlwelser My page is private, so if you send a friend request I'll answer it. 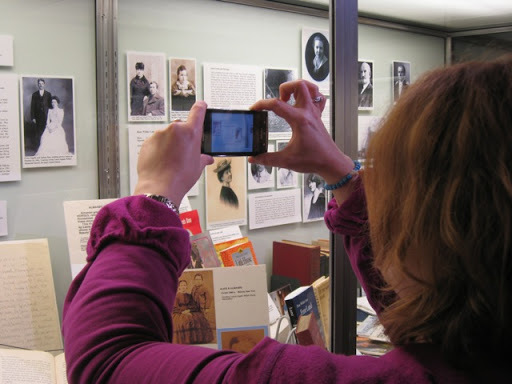 You might be interested in my pics from my visit to the Detroit Public Library. I was able to see the manuscripts in person! Couldn't touch though (which is what I really wanted to do!). Thanks Laura. Sent you a request. My friend and I were going to go to the Detroit Public Library, but we ran out of time. I look forward to seeing those as well…thank you!